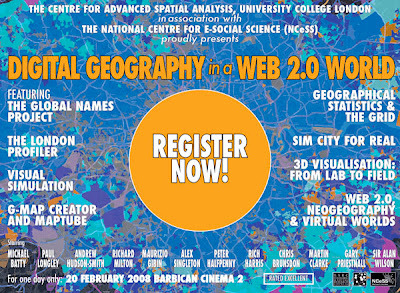 We are pleased to announce a CASA and Digital Urban one day event at the Barbican Cinema 2 in London: Digital Geography in a Web 2.0 World. The event on February 20th will see a series of talks from the leaders in the field of neogeography and visualisation. With talks ranging from Sim City for Real to our GMap Creator, MapTube and Image Cutter software suite its looking like a good event. We are talking on Web 2.0, Neogeography and Virtual Worlds so if you a reader of the blog and can get to London we hope to see you there. The event is free of charge, simply go to our event page and email for the required password, you will then be able to register online. The full programme can be viewed from here. Note spaces are strictly limited. This is missing two important facts up front: when??? and were? and with Second life is there a place in Sl or a feed for those not in England?